description: LA BRANDE is an old estate set in 90 acres of rolling countryside near St Gourson, south east of Ruffec in the Charante Region of France. The estate is currently being totally re-developed and regenerated based on ethical, organic, conservation and environmentally friendly methods and practices. Combining a French holiday plus a course that provides you with the opportunity to achieve real practical and environmental skills (that can be honed over a lifetime) and still leave time for you to explore and enjoy the surrounding countryside and wildlife. The holiday courses are of one week duration - arrivals are on a Sunday afternoon and departures on Saturday morning. They are made up of individual two-day units and are based on the holistic design principles of PERMACULTURE which embraces the philosophy of co-operation with nature and caring for the earth and its people. We offer a wide variety of holiday choices throughout the year which contributes positively to the surroundings, provides a venue that minimizes the negative effects of tourism and supports the local community. fees: Combining an activity course with a holiday is very cost effective as course fees remain the same all year round. They are £80 per day for 4 days and this includes tuition, the use of tools, equipment, materials plus light mid-day refreshments. A firm booking can be made by completing the Booking Form on our website and enclosing a non-refundable deposit of £100. In the event of cancellation your deposit can be used for another course or you can gift it to another person or group within 12 months. There is also a 10% discount for groups of six or more participants. On receipt of your booking, we will confirm your registration, the amount of outstanding fees and full details of the course including maps and local information. To confirm your booking you will need to pay the balance no later than six weeks before the Course start date. If booking within the six-week period, full fees are required when booking. accommodation: We use good quality local accommodation and therefore contribute to the earning potential of the local community. Course participants are provided with self-catering twin (or more) bedded accommodation. The cost is £20 per night and remains the same throughout the year. If, however, you require a single occupancy, there will be a small supplementary charge. Partners of course participants (who are not attending a course) are welcome to join them if they share a double room but there will be a supplementary charge. Course participants bringing their families (who are not on a course) will be accommodated in a self-contained gite which we help you find or you may wish to source your own accommodation nearby, including camping and join a holiday course for the four days at the daily rate. We can also arrange extra accommodation nights if you wish to stay in the area longer. 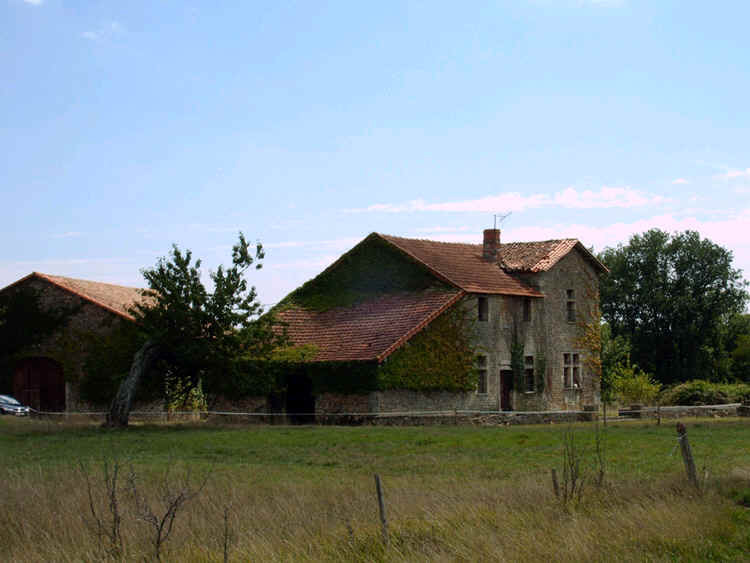 location: The surrounding area is dotted with charming Chateaux, pretty villages, small towns and plenty of easy walks on the quiet backwood tracks. 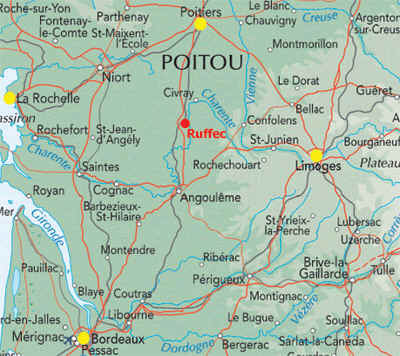 There are wonderful restaurants and small cafes in and around the Ruffecois area and the larger cities of Poitiers, La Rochelle, Limoges and Anglouleme with their ancient history and modern activities plus well know vineyards and wineries are all are within two hours by road or rail. By train: Eurostar to Lille or Paris and 2 hrs by the fast TGV to Poitiers/Ruffec. By air: 1 hr from Poitiers Airport and 2 hrs from Limoges/Bordeaux airports. By car: 5 hrs from the Normandy ports. Car Hire is available from all airports and train stations. Make a Holiday – Make a Difference!